Could innovative water balls be the key to reducing plastic waste? Home » Blog » Could innovative water balls be the key to reducing plastic waste? Who would have thought that small spheres filled with natural or flavoured water could be the future solution to London’s plastic waste problem. 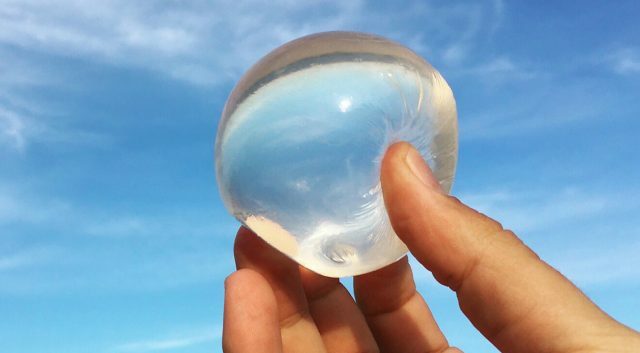 In hope for a more sustainable future, the UK start-up company Ooho has started to create water balls, which resemble large bubbles and have a jelly-like membrane made of plant and seaweed extracts. Instead of drinking from a plastic bottle, which will eventually be thrown out, the Ooho balls are consumed whole with no plastic necessary. The Ooho balls have begun quenching the thirst of consumers around London and with so many cities around the world struggling to dispose their plastic, there is no better time than the present to welcome such a product to the market. Just last month 4,000 plastic bottles alone had been removed from the River Thames, demonstrating the scale of the plastic bottle problem. In addition to being 100% consumable, if not used the Ooho balls will simply decompose after four to six weeks. While Ooho may not be the solution for all the applications that plastic bottles have, they are definitely a solution for short term consumption. The innovative balls were first trialed near London Bridge mid-April and they drew a mixture of surprise, amusement and delight among those who sampled them. Researchers at Skipping Rocks Lab have invested three years into research and development to create Ooho. Manufacturers can now produce up to 2,000 balls a day and are working on increasing this figure, as well as extending the shelf life of the product and improving the resistance of the membranes. The company has plans to attract a vast amount of consumers, such as marathon runners, who will be able to dispose the Oohos mid-race without concerns about the environment. Ooho is also working on the encapsulating of alcohol, which will again target a whole new market. The company plans to further invest into R&D to engineer the membranes to ensure hygiene, transportability and flexibility. Researchers and company stakeholders are convinced that Ooho will bring change to society’s unsustainable habits in a big scale and are excited for the R&D outcomes which lie ahead. If your company, just like Ooho, is innovative and carrying out R&D activities, contact Swanson Reed to find out how you can benefit from the R&D Tax Relief.